My brother has become a problem for my family. Although has always been volatile, I love him – he is my brother – but you don’t go taking sides with anyone against the family, not ever. Donald Jr has a good heart but he is weak, and stupid, and this is life and death. He has broken my heart! I am thinking of taking him on a fishing trip to Lake Tahoe; will this put an end to my family’s misery and the darkness that has infected my soul? What’s the point of siblings anyway? Mums and dads seem to think having more than one child will be great for everyone because they will be darling playmates and entertain each other so that the grown-ups can look at their iPhones all day long without being disturbed by annoying children all the time but in reality what happens is that while mummy is deep in Candy Crush Saga, someone is having their eyes gouged out with a piece of lego and someone else has been drop-kicked in the face and force-fed half a kilo of yellow play-doh. THE Queen has responded to a breach of etiquette by Canada’s Governor General by smashing her elbow right into his chin. 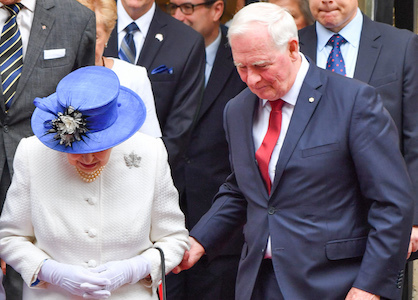 David Johnston laid hands on the monarch’s elbow while descending a staircase in London, against all protocol, and attempted to claim his infraction was because of a ‘slippy carpet’. But Elizabeth II immediately recognised the assault on her person – and Great Britain – and after pausing for breath, suddenly slammed her elbow into his jaw. As he rolled dazed to the foot of the stairs, Her Royal Majesty clambered to the top and, displaying her white-clad elbow to the baying crowd, prepared to unleash her signature ‘elbow drop’ move. To chants of ‘finish him’ the Queen then leapt into the air and seemed to hang motionless for a moment before impacting with full Royal force onto His Excellency’s chest. She then stripped him off his official Great Seal of Canada and held it aloft to the deafening cheers of the assembled public. After hospital treatment the Governor General will be returned to his native Canada to live alone on an ice floe, in accordance with tradition.